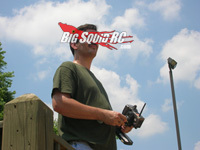 ASK Cubby, Version- You Write The Questions, Me Posting Random Answers « Big Squid RC – RC Car and Truck News, Reviews, Videos, and More! Hi Cubby, my name is Bruce and I read all your stuff. My Halix does ok in grass and on loose dirt but i was wondering which tires you would use for those conditions? Also, what servo do you recommend for the Halix? The stock servo in mine is starting to go out. Cubby- Ok Bruce, you have my attention now. I must say you are persistent. For those of you that are not Bruce, he was written me pretty much the same question every week for over a month. So here ya go Bruce, welcome to the big time. And oh yes, the Vaterra Hälix is bad azz. I drive one a lot, mainly because I like how it looks, and love how it drives. It isn’t bad out of the box, but after a few minor mods it becomes a pretty epic basher. So where were we??? Oh ya, tires. IMO there is only one choice for tires when driving the Hälix on grass and loose dirt, Pro-Line Badlands. They have huge knobbies that dig in deep, giving loads of traction on both of those surfaces. Now, if you do much pavement driving I would change that over to Pro-Line Trenchers. When driven on pavement Badlands will wear off their sharp edges, reducing the grip they give, but Trenchers will last you a very long time, even when driven on asphalt/concrete/etc. And lastly… what servo would I recommend? The Hälix does present a sizable load to a servo. It is 4wd, it will typically have some serious power going to the wheels, and you’ll be running fairly heavy 10th scale MT tires, so I highly recommend at least a 150oz/in servo for torque. My personal fav at the moment (and the one I run in my Hälix) is a Hitec D945TW. Nope, it isn’t cheap, but damn is it smooth, with above average speed and wayyy more than enough torque for your application. I consider the Hälix to be an elite bash machine, therefore I run an elite servo in it. Peace and love, and keep those letters coming Bruce. Oh great Cubby I need to call on your infinite wisdom. I want to upgrade the power in my ECX Amp MT, do you know how much I can put in it before it blows the transmission to smithereens? Can I run something like a Castle 3800 combo, or is that going to be too much power? Cubby- Well good evening/afternoon/morning to you Dave, I hope you’ve been enjoying your ECX AMP MT. I know we sure have, those things just seem to love abuse, and that is pretty much all we ever do to a car. So… you wanna slam some more power into your AMP MT, but don’t want it to become un-reliable. I hear ya on that one. So here is the scoop. No, I have never tested the AMP MT to see just how much power it can hold on a day-in, day-out basis. However, while I generally dislike sensored point 5 systems, I have been running a 13.5 in our test truck and it has held up quite well. A typical 13.5 system doesn’t put out serious wattage (sorry “racer guys”, they just don’t, or at least not what I consider serious power), but it does have a nice bump in power over stock. The other advantage to running a low power BL unit is maintenance, or lack thereof. Where as the stock brushed motor in the AMP MT might last you a couple of hard months (I always break mine in by water dipping), an aftermarket 13.5 system could potentially last years. Combine the 13.5 with a decent LiHV battery (and proper gearing!!!) and your AMP MT will have significantly more rip than stock while still being reliable. Whoop there it is, yet another edition of ASK Cubby. Listen, I know you have questions. I know you feel pain. I know you feel the need to vent. Let it rip at thecubreportrc at gmail dot com. Like usual, if your letter sees the light of day on our front page you’ll get a free sticker pack. Better yet, if I proclaim yours as “Letter of the Month” you’ll get a Free BSRC t-shirt.